Travel to the land of the Tsars and discover the wonders of the former Soviet Empire. Start your adventure in Moscow, where the Kremlin and Red Square will leave you speechless. Delve into the rural heart of Suzdal and Vladimir, the jewels of the Golden Ring. Discover the ancient city of Yaroslavl before taking a 1st class train to St. Petersburg to admire the artistic legacy of the Hermitage. International flights UK - Moscow, Saint Petersburg - UK. 2nd class seat train from Moscow – Vladimir & night on board the train from Yaroslavl - St Petersburg in a 1st class compartment. 9 Breakfasts, 3 Lunches and 4 Dinners. * For departures on 16th August, the hotel in Moscow will be Moscow Novotel Centre 4*, in Suzdal the Veliy Hotel Suzdal 3* and in St. Petersburg the Park Inn Pulkovskaya Hotel 4*. * For departures on 6th September, the hotel in Moscow will be Moscow Novotel Centre 4*, in Suzdal the Knyazhy Dvor 3* and in St. Petersburg the Hotel Saint Petersburg 4*. IT IS IMPERATIVE THAT YOUR PASSPORT DETAILS ARE CORRECT FOR THE LETTER OF INVITATION. The letter is necessary for making your visa application: IT IS NOT A VISA. If you have any questions please contact our customer service department on 02080683176. *** The Foreign & Commonwealth Office offers up-to-date travel advice by visiting www.gov.uk/foreign-travel-adviceIt is mandatory to send a copy of the valid passports of all passengers to customers@exoticca.com once you have made your reservation. Arrival at the departure airport ready to embark on the flight to Moscow. Arrive in Moscow, transfer from the airport to the hotel. Arrival at the hotel and overnight stay in Moscow. Feel free to get out and about and discover Moscow at your own pace! Breakfast at the hotel. Today, visit the Tretyakov Gallery, which is home to the largest and most impressive collection of Russian fine art. Be amazed by the splendour of your surroundings and the beautiful works of art. Head to lively Arbat Street, for a tour of one of the most emblematic roads in the city, before exploring some of the city's metro stations which are astonishingly decorated and a popular attraction for visitors. Overnight stay in Moscow. Breakfast at the hotel. Today, head off to Gorki Leninskie, once a retreat for Muscovite noblemen, before later being nationalised under the Soviet government and then used by Lenin in his later years. (Entrances are not included.) Discover its history and its beautiful architecture and enjoy an included lunch. Return to Moscow in the early evening and spend the rest of the day at your leisure, discovering the city's nightlife. Overnight in Moscow. Breakfast at the hotel. Check-out and begin the day with a tour of the Kremlin Grounds, one of the most impressive artistic ensembles in the world. Inside you will see the majestic Arsenal, the Senate, Congress Palace, the Grand Kremlin Palace, the Czar's Canyon and the cathedrals of the Archangel Michael of the Twelve Apostles and the Assumption. In the early afternoon, transfer to the railway station for a train to Vladamir, in the heart of Russia's Golden Ring. Arrive, transfer to Suzdal and check-in to the hotel. Enjoy dinner and an overnight stay in Suzdal. Breakfast at the hotel. 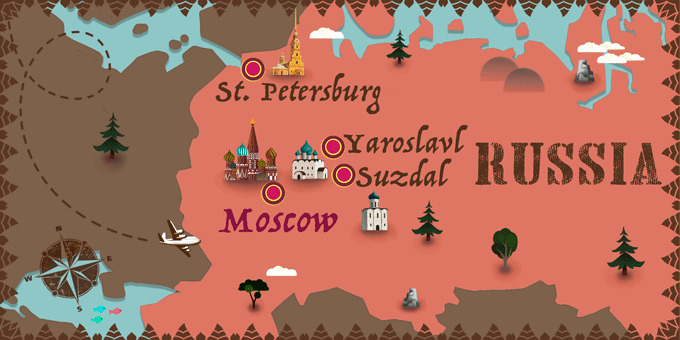 Today, tour the ancient Russian cities of Suzdal and Vladimir. Discover it's main cathedrals and historical monuments. In the Monastery of Saint Rufino, hear the concert of bells. Visit the Museum of Wooden Architecture, and learn about the abundant history of this region. Lunch. In the afternoon, travel to Vladimir, home to a museum of religious history and antiquities and a fascinating art gallery. Visit the historic Cathedral of the Assumption and the stunning Golden Gate. Return to for Suzdal dinner and an overnight stay. Breakfast at the hotel. Check out of the hotel and visit a local Poultry Farm to learn about the different species of geese, duck, chicken and partridge that are reared in the area. Enjoy some tea tasting before departing by road towards Yaroslavl, famed for its historical significance, gold-domed churches and situated at the confluence of the Volga and Kotorosl Rivers. Check-in at the hotel and enjoy dinner and an overnight stay. Breakfast at the hotel. Enjoy a morning city tour of Yaroslavl. The historic centre of the city is a World Heritage Site and offers plenty of beautiful sights such as the 12th-century Spaso-Preobrazhensky Monastery and the 17th-century Church of Elijah, with its charming domes roof. Explore the sights of the city with a guide. Return to the hotel for lunch and spend the afternoon at your leisure before an dinner and transfer to the railway station for your 1st class overnight train to Saint Petersburg. Night on board. Arrive mid-morning to Saint Petersburg and meet your guide at the station to begin a fascinating city tour. Discover its main architectural monuments, avenues and canals. After the tour, transfer to the hotel to check-in. In the afternoon, explore the St. Peter & St. Paul Fortress, the original citadel of the Tsars. It is the authentic old core of the city. Overnight in Saint Petersburg. Breakfast at the hotel. Set off for a visit to the Winter Palace, the former residence of the Russian Tzars which currently houses the world-famous Hermitage Museum, one of the largest museums and galleries in the world. It is home to approximately 3 million pieces of art, exhibited over 400 rooms. In the afternoon, visit Catherine Palace in Pushkin, just outside of the city. It was the former summer residence of the Tsars and is adorned with impressive Rococo decoration. Return to Saint Petersburg for an overnight stay. Breakfast at the hotel. At the indicated time transfer to the airport for a flight back to the UK. Arrive in the UK and end your trip.